Supreme Court (SC) Justice Asif Saeed Khosa suffered a heart attack and was admitted to the Punjab Institute of Cardiology (PIC) for treatment on Tuesday. 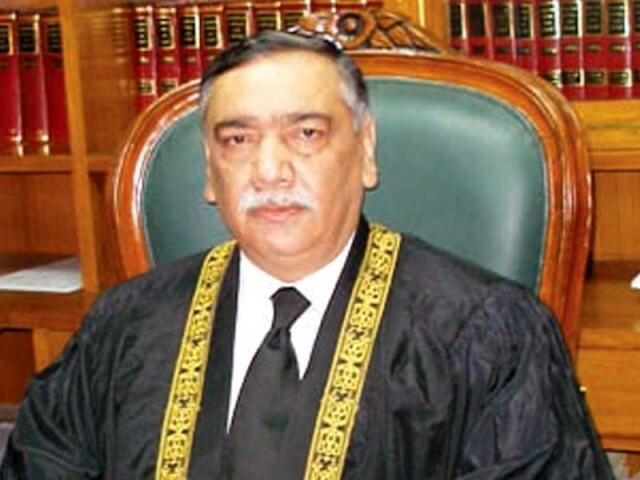 Justice Khosa was a part of the five-member SC bench that disqualified former prime minister Nawaz Sharif last month. The judge had observed that the prime minister had deliberately suppressed relevant facts, or he had conveniently allowed himself to go along with a false story advanced by his children. According to reports, the judge was admitted to PIC after he experienced chest pain. The doctors there confirmed to a private TV channel that the judge had suffered a heart attack and would undergo angioplasty. According to details provided by doctors, two valves of the judge’s heart were blocked which caused the heart attack. Later, hospital sources suggested that a team headed by Prof Dr Nadeem Hayat Malik and Prof Dr Shahid Ameen carried out the medical process, and now Justice Khosa’s condition was improving. Meanwhile, Chief Justice of Pakistan Mian Saqib Nisar visited the PIC to inquire after the senior judge. He remained there for some time, and doctors briefed him about the treatment being provided to Justice Khosa. Justice Ijaz-ul-Ahsan also accompanied the CJP. He is responsible for loss of billions to innocent Pakistanis who have been doomed and lost everything because of their controversial decision. It’s a curse from Allah on him. Shame on You Sir. This guy is a beacon of hope for people like me with no political cover. The same could have been said for Kulsoom Nawaz but then again that was a sham disease; thats why the crooks all go to London for “treatement.” Inshallah this abroad treatment of the rich will end soon. I am not a fan of Nawaz Sharif. The way this case has been handled is a mockery of justice. Instead of being given exemplary punishment NS has been ousted from power on frivolous grounds and the corruption cases have been referred to NAB which may take years to decide. In my opinion he has been provided a safe exit. This has created uncertainty resulting in panic in stock marke and thousands of innocent investors have lost their hard earned money ( me being one of them). NS/ Ishaq Dar and their entire family should have been Jailed forthwith for looting public money and thier entire property should have been confiscated. NS/ Ishaq Dar are still ruling the country and calling the shots whereas Abbassi is just a puppet. What kind of justice is this. In my opinion the judges are to be blamed for creating all this mess and chaos. Hope you understand.